I adore Japanese cuisine and I love to spend lots of money on it at restaurants but sadly, due to a lack of Japanese culinary knowledge, I very rarely attempt cooking it at home. There was a time in my life when I was addicted to and obsessed with salmon sashimi. I’d buy a pack on my way to work and again at lunchtime so that I could satisfy my weird craving. I’d even have dreams about it – should I be admitting that?! So I jumped at the chance to sample the express menu at the newly opened Senkai on Regent Street. Housed in the old Cocoon, Senkai is a vast space with low ceilings and subtle touches of Japanese influences in the design. The lunch, with a host of other bloggers / journalists was a lovely and light way to end the working week. And I say light with a reason. The express menu has four options, SEAFOOD, VEGETARIAN, RAW and RAW AND ROBATA. I opted for the RAW (£25) as it consisted of three pieces of sashimi, edamame beans and a salmon carpacchio. I couldn’t have wished for a fresher and lighter meal on a Friday afternoon. 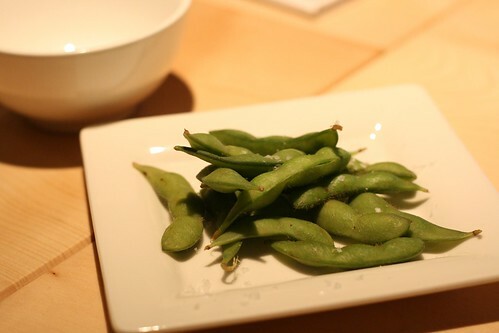 The edamame beans arrived and were perfectly crunchy and had a crisp layer of sea salt. 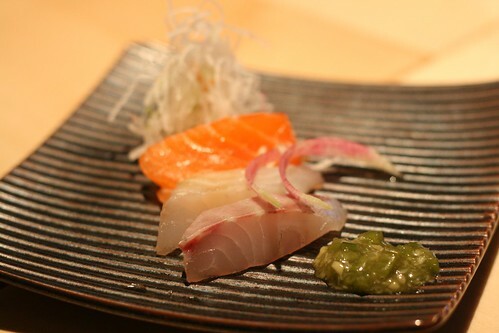 The sashimi was next to arrive – the smooth and silky slivers of fish were extraordinarily fresh and as I finished the last mouthful of salmon (I always save the best until last), I wished the portion was twice the size. 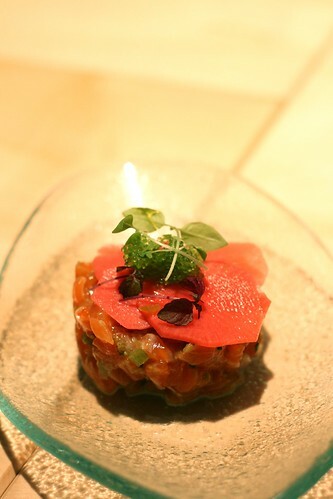 Next up was the salmon carpacchio, which had a sprinkling of bright green fish roe and pickles placed neatly on top. The salmon was laced with a wasabi chutney and gave only a hint of the Japanese spice. It was delicious, although again I wished for more after the last mouthful. Each option on the menu comes with a glass of wine, mine was Riesling J.J. Prum 2009, Mosel, Germany but it got left by the wayside as I am not a fan of Reisling. Feeling content but not totally full (hence my comment about the lunch being ‘light’ earlier), we were presented with a dessert menu – not something you want to see when a personal trainer told you to cut down on carbs and sugar at 7.30am that morning. Nevertheless I had to go for the chocolate fondant (£8.50), partly because everyone around me did and I know how much food envy I would have had if I didn’t order it! It arrived on it’s own at first and I was surprised at how small it was. I had forgotten that it came with three scoops of ice cream, which followed shortly after. Three neat scoops of green tea, cheery & sake and vanilla ice cream graced the plate and brought the dessert up to a suitable Food For Think like size. The fondant was almost wobbling when I shook the plate and the runny hot chocolate immediately oozed all over the plate as soon as the spoon was forced through the thin top layer. The green tea ice cream wasn’t to my taste – it had a bitter after taste but then I’ve never really been one for green tea! The cherry & sake had a subtle fruity taste that matched well with the sweet chocolate but the vanilla was my favourite, not too dissimilar to cookies and cream Haagen Dazs. 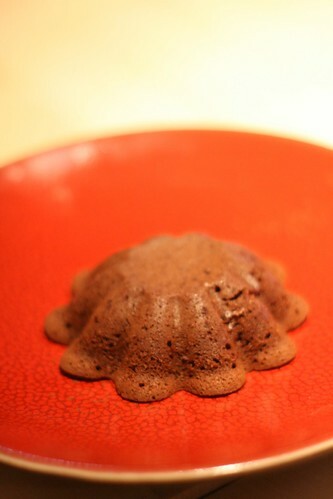 I’d go so far to say that this is the best chocolate dessert I’ve had at a restaurant for a while. Senkai is not cheap by any stretch of the imagination but I’m already hoping to go back and try the a la carte menu delights on offer. Food For Think was a guest at Senkai. 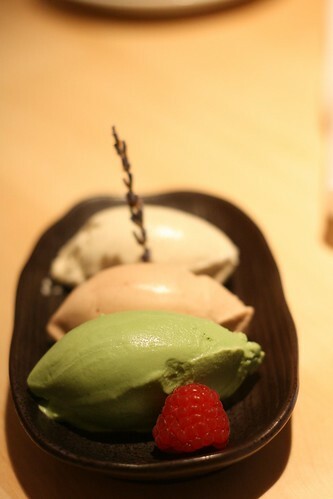 That dessert looks delicious…shame about the green tea ice cream but I guess it’s not to everyone’s taste. Love the sound of the cherry sake version though. 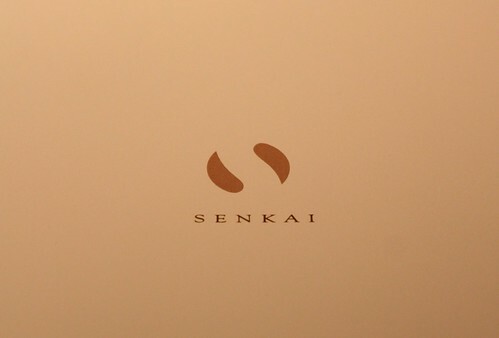 Must get myself down to Senkai soon!